LAS VEGAS, NV (Laserfiche) Oct. 20, 2008—Laserfiche® announced today that it will showcase the Rio enterprise content management (ECM) system at the ARMA International Conference & Expo at the Las Vegas Convention Center Oct. 20-23, 2008. 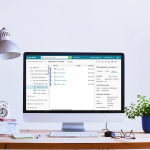 “We’re excited to be able to share our transparent records management capabilities which are powerful, effective, and user friendly,” said Laserfiche President and CEO Nien-Ling Wacker. The Rio system’s named user licenses provide a full range of ECM functionality, including workflow automation, Web-based document management, audit trail tracking, DoD 5015.2-certified records management, and powerful capture tools. Rio also offers greater interoperability with Microsoft Office applications, particularly SharePoint. Rio includes an unlimited number of Laserfiche servers and repositories, which organizations can use to support failover clusters, testing environments, and multiple locations. To expand their systems, organizations simply purchase additional licenses, which eliminates long requisition processes and makes budgeting for enterprise deployment much easier. In addition, Collin County, TX Records Manager Margaret Anderson will demonstrate how she carried out her county’s strategic goals using Laserfiche records management software tools. On Tuesday, Oct. 21 from 1:00 P.M. to 3:30 P.M. in the East Concourse, Anderson’s session will explain how the Laserfiche Records Management Edition provides the records management backbone for the county’s case management system, used by the District Clerk, District Attorney and County Court at Law Clerk’s offices. She will also discuss how the system has been expanded to other county departments such as Human Resources and Public Works. Anderson will focus on how to use technology to provide quality public services in a cost-effective manner. She also plans to teach participants how to assess the records management needs of their organization, as well as design, plan, and implement a records management system. Anderson, a Certified Records Manager, has 20 years of experience in records and information management, as well as extensive experience in local government and petroleum exploration and production. She taught basic records management at Brookhaven College, is a past president of the ARMA Dallas Chapter, served as ISG Government Sector Manager, and was an ARMA Southwest Region coordinator. She recently served on an expert panel for the Council of State Archivists’ Local Government Task Force for the NHPRC-funded ”Closest to Home” project. Laserfiche will be present at booth #347.